Much like DC Comics TV shows Arrow, The Flash and Gotham, CBS' Supergirl has already been introducing a number of comic book characters. Spoiler TV has released nine new photos from the sixth episode, Red Faced, which introduces the new villain Red Tornado (Iddo Goldberg). The character was confirmed to surfaced this season during the TCA press tour in August. The official synopsis for Red Faced reveals that personal and professional stress get the better of Kara (Melissa Benoist) when she goes too far during a training exercise against Red Tornado, a military cyborg commissioned by Lucy Lane's (Jenna Dewan-Tatum) father, General Sam Lane (Glenn Morshower). Also, Cat's tough exterior is shaken by a visit from her judgmental mother, Katherine, and Alex enlists Winn to look into her father's mysterious death, on Supergirl, Monday, Nov. 30 (8:00-9:00 PM, ET) on the CBS Television Network. Guest stars include Iddo Goldberg as Red Tornado and its creator, Dr. Morrow; Joan Juliet Buck as Katherine Grant, Cat's mother; and Glenn Morshower as General Sam Lane, Lucy's father. Created for war, Red Tornado is the world's most nefarious android who is capable of devastating National City. Once free from the U.S. government's grip, Red Tornado sets out on a path of destruction that only Supergirl (Melissa Benoist) will be able to stop. 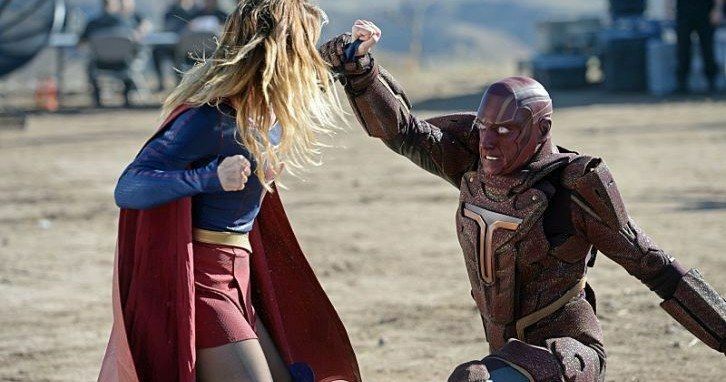 We first reported on Red Tornado's presence on Supergirl in August, but the character had not been cast yet. That report also revealed that a Kryptonian villain named Non will be introduced in the first season of Supergirl. In the comics, Red Tornado was originally crafted as a villain, but he eventually became a hero that ended up joining the Justice League. His powers include the ability to manipulate wind, along with superhuman strength and speed. CBS' description makes it clear that Red Tornado will be a villain on the show, but it remains to be seen whether or not he will eventually transition into becoming a hero. Iddo Goldberg joins a growing roster of guest stars that includes Peter Facinelli (Maxwell Lord, Chris Browning (Reactron), Jenna Dewan-Tatum (Lucy Lane/Superwoman) and Brit Morgan (Livewire). This roster will surely get bigger and bigger as the season unfolds, so stay tuned for more details. The main cast includes Chyler Leigh as Alex Danvers, Mehcad Brooks as Jimmy Olsen, Laura Benanti as Alura Zor-El, David Harewood as Hank Henshaw and Jeremy Jordan as Winn Schott. Dean Cain and Helen Slater are also starring as Kara Zor-El's foster parents, the Danvers. The show's first season continues on Monday, November 16 with How Does She Do It?, followed by Livewire on Monday, November 23 and Red Faced on Monday November 30. Take a look at these new photos below, and stay tuned for more on Supergirl.